We are on our forth cruising sailboat. In this case that means a sailboat with over night facilities. So far, we have done only weekend or week long cruising. With the speed of sailboats this has not gotten us far from homeport. Since 1989 we have sailed/owned a Hunter 25, a Hunter 27, a Compac SunCat and now the Irwin 10/4. Our love of sailing started in 1973 with our Sun Flower. This boat was a fun car topper, which we had pure sailing fun with on Biscayne Bay. We sailed across sandbars and shallows where bigger boats fear to sail. Of course, that tour boat looked mighty big, bearing down on us with its mighty bow wake and loud horn. That little lateen rig carried us where we wanted in extremely light wind. The 1974, Hunter 25 (Cheap Thrills), could hold its own to nearly 40 knots. It had been sailed in the Bahamas, and sported doubled fore and aft stays. This boat was swept from its mooring near Coconut Grove, Florida by hurricane Andrew in 1992. It was later discovered a few miles south with its mooring still attached in Davy Jones' locker. A derelict sailboat with its identification numbers filed off had become tangled with Cheap Thrills' rigging. We still have the compass! With the hurricane behind us, it was time to spend hurricane insurance money. The Hunter 27 (Windlass) was a great overnighter, and we had some wonderful times with family on board. In heavy weather it had too much free board, and the engine was a bit underpowered. In 30 knots of wind blowing off shore, it was a struggle to get back to the dock. 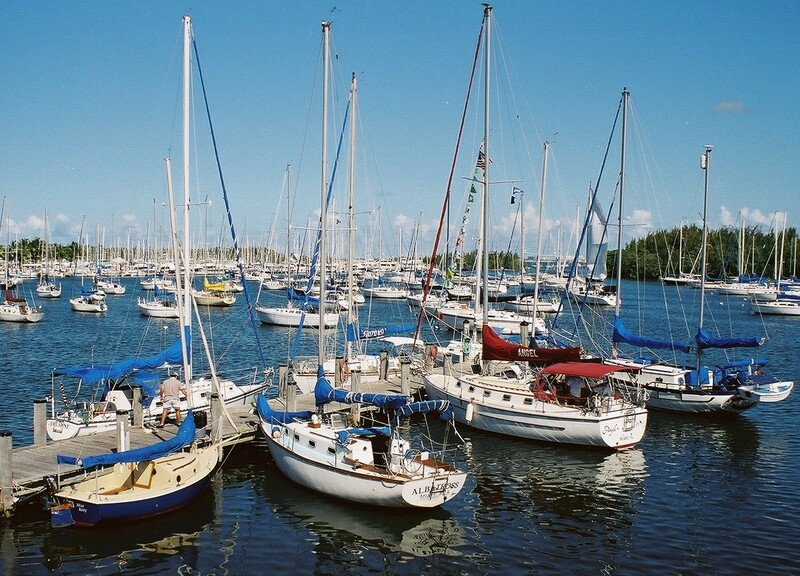 The time spent with these Hunter sailboats was also spent with the Venture Sailing Club of South Florida. This is an extremely active and informative sailing club. They originated as a trailer sailor, Venture sailboat club. When we joined the club there were a few trailer sailboats, but only one McGregor sailboat. 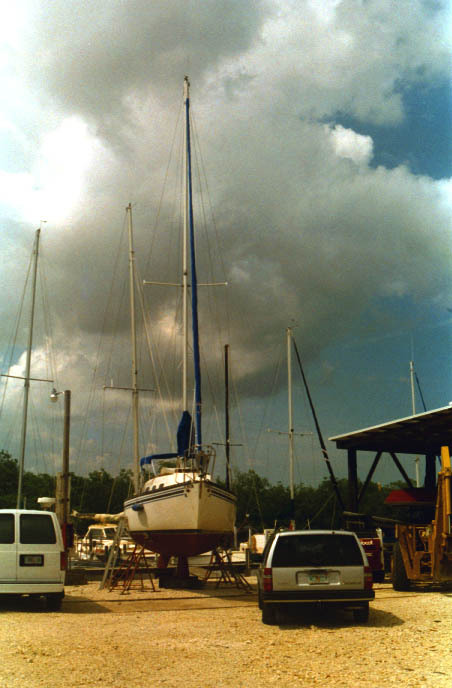 After hurricane Andrew, there were a lot of upgrades to non-trailer sailboats. What fun! In 1998, we moved to Central Florida, and sold Windlass. We had the idea that we could go without a sailboat, and save money. Contrary to what you might think, it seemed that we had less money and a lot less fun. It wasn't long before Marshall bought plans to build a 17 ft. catboat. The garage soon had the keelson sprouting ribs. It is suspected that the admiral (Maria) was not as confident as the boat builder, and was unimpressed with the space it took up in the garage. When we moved to a house with a smaller garage, we suddenly found ourselves looking at a fiberglass catboat on a trailer. 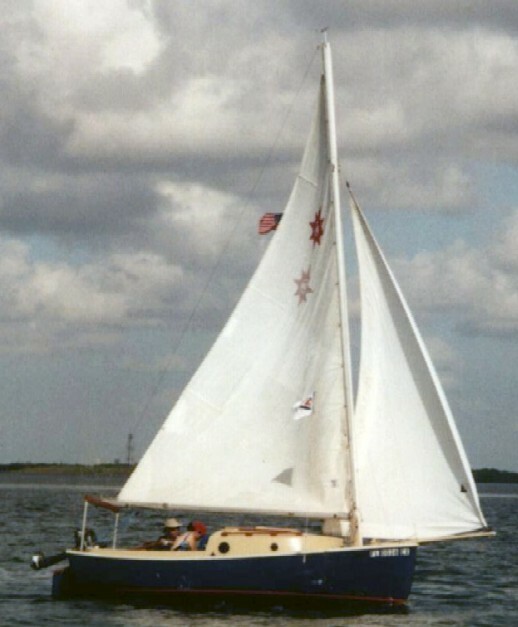 This was to become Mist Kitty, a 1983, original, Compac SunCat. The SunCat turned out to be a great sailing boat. It had a bowsprit with a small roller furling fore sail and a Marconi rig with a large main. Mist Kitty had a way with light wind. The big main was so powerful for such a small boat that you had to be a little cautious going downwind with a stiff breeze. We sailed this boat until 2002. We sailed on both the east and west coasts of Florida and in Biscayne Bay. One of our Biscayne Bay trips was our first race, the Miami-Key Largo Race hosted by the Miami Yacht Club, 2002. A kind of informal race in April when you sail from the Key Biscayne Causeway to Jew Fish Creek in Barnes Sound. We really didn't know what we were doing. A fellow Compac owner and sailing instructor at the Coconut Grove Sailing Club (CGSC), had invited us to take a mooring at the club and enter the race. During the race we took a detour through the Featherbeds near Boca Chica Key. All other participants stuck to the main channel of the ICW. We figured we had no chance in the race anyway, so we thought we would have some fun. In spite of this, our little boat seemed to keep an almost steady 4 knots. After heading back toward the main channel, the tidal current carried us to the east of the channel. At this point we noticed that we were slowly passing some of the same boats we had passed previously, due to the light wind. We continued to pass boats until we reached Barnes Sound, where we had sailed a lot with our Hunter 27. The wind is usually better there, as it was that day. Now we were moving along between 5 and 6 knots, but the bigger sailboats were doing even better. This was a load of fun, and we later found out that we made 3rd in our class. It was just a thrill to be around all those boats and make new friends. In 2002 we sold Mist Kitty and bought Orion, an Irwin 10/4. This was a sailboat Marshall had admired on a hurricane run off Biscayne Bay. Someone from the CGSC was gunk holing in the mangroves where we were tying off. From our inflatable tender the roomy cockpit and broad beam (10 ft. 4 in.) had made an impression, as Orion did when we first saw her. We didn't realize that Orion was not like the stock Irwin 10/4 right away. The sea trial was a light wind day, but Orion sailed quite well with the main and a large cotton canvas Genoa. The former owner agreed to help us clean and paint Orion's bottom before taking over ownership, which he and Marshall did at Fort Myers Yacht. After some sailing adventures from the Fort Myers area, Orion is now sailing from St. James City, Florida. Damage has been repaired, and we have made some improvements. New cushions have been made and new portlights installed. It was hard to get up the courage to cut the holes, but we did it. UPDATE: After a very hot trip to Cayo Costa State Park we decided to move the boat to the St. Johns River area near Palatka, FL. In doing so we have avoided some hurricane related worries, and are now closer to Orion for making improvements.